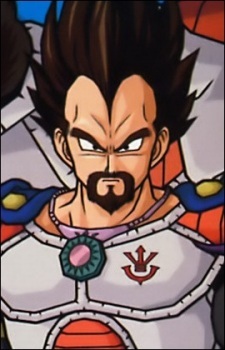 King Vegeta was the king of the Saiyans, and is mentioned several times in the manga, however only appears in filler episodes and movies. Believed to have been the strongest Saiyan, in the manga, it was said that he had been surpassed by his own child, also named Vegeta. Before the attack on Planet Vegeta, he realized that Freeza was afraid of the Saiyans, and he coordinated an assault on Freeza. According to the anime filler, his attempt to attack Freeza failed as he was easily killed. The Saiyan elites that followed were also defeated by Freeza. In the movie Broly: The Legendary Super Saiyan, he ordered both Broly and his father Paragus' to be killed, because he was afraid of Broly's abnormally high power. King Vegeta is only seen in the anime special, the film Broly: The Legendary Super Saiyan, and in some original scenes in the anime series. His appearance is never shown nor described in the manga, but he is mentioned briefly in a dialogue from Freeza to Vegeta in the original manga. Vegeta, Nappa, Turles and Raditz. Let's face it, most Saiyans of Dragon Ball Z have never been the friendliest of people, but could the Saiyans race have actually had the potential to be the most noble people in the universe?